Gachi Mbugua, a non-teaching staff at Dagoretti High School, and Don Otieno, a prison officer, were both awarded Sh1 million and Sh500,000 for winning bonus prizes in the ongoing Bonanza promotion by online bookmakers,Betway. Mbugua and Otieno, correctly predicted 5 out of 6 games and 4 out of 6 games, respectively, in the Betway’s Bonanza promotion held last week. The two winners could not believe there luck when they received a call from Betway informing them of the huge cash prizes. Thinking it was a scam from fraudsters; Mbugua switched off his phone and concentrated on the day’s work. “I could not believe it at first. I thought it was just a scam from the usual conmen who go about stealing from Kenyans. 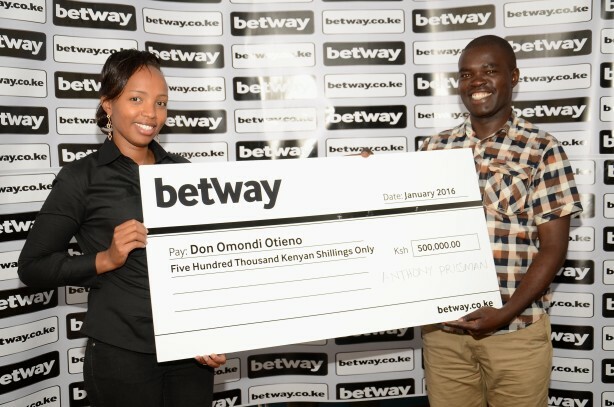 But after receiving the confirmation text and a call from Betway I knew it was real,” said the other winner, Otieno. The two have been betting on small multiple bets for close to four months now since the entry of Betway into the Kenyan market. The latest payouts are the largest amounts both have ever won from the online betting platform. There are several games with massive jackpots to choose from as a part of Betway’s offerings. Soccer jackpots run every week with millions in potential winnings. On top of this are newly-introduced guaranteed bonus prizes above the main Bonanza jackpot amount that are won by getting at least 4 out of 6 predictions correct. Big payouts can certainly be achieved even if all the predictions aren’t correct. Betway is the official principal sponsor of English Premier League soccer team West Ham United and a leading global bookmaker. Interestingly, in October, they awarded a player in the UK a world-record jackpot sum of £13.2m (KSh2bn) to a winner playing their online slot games. Soccer fans can place bets on their PCs, mobile devices or even by SMS using the Betway short code 29029. Depositing is also made very simple with the widely used M-Pesa banking solution, on which Betway (Pay bill 880185) can be easily found, making real-time deposits the standard of quick and streamlined betting.